Croissant French Toast Casserole with Berries and Cream - VIDEO!!! 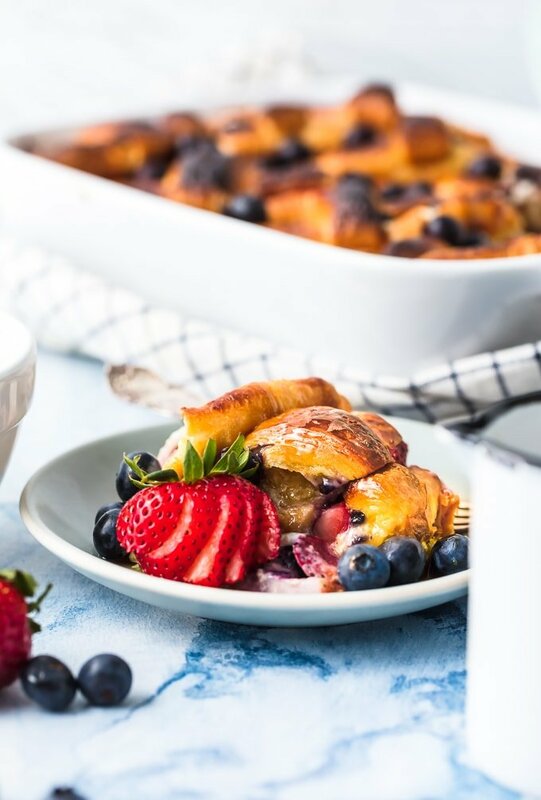 Croissant French Toast Casserole with Berries and Cream is our favorite easy brunch recipe fit for your closest friends and family. 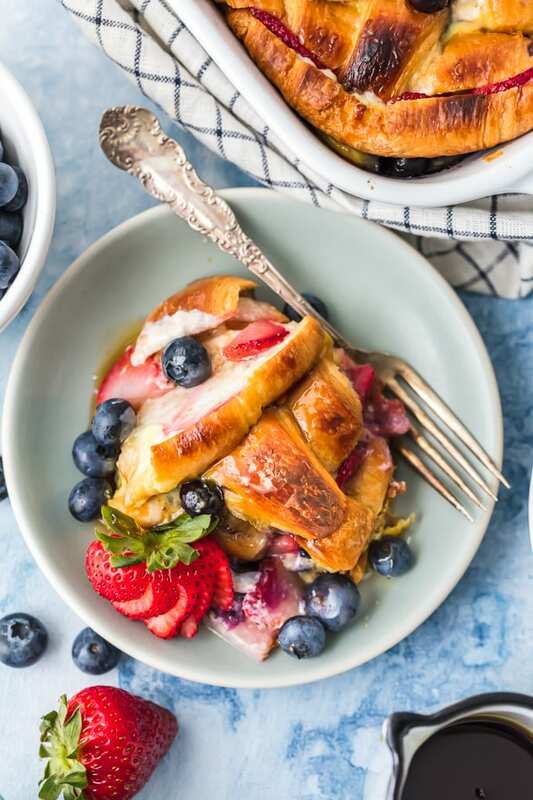 This indulgent breakfast French Toast Bake is made with layers of buttery croissants, sweetened cream cheese, and fresh berries. You can make it ahead or right before you’re ready to eat. Baked French Toast Casserole with Strawberries and Blueberries is the ultimate way to wake up! This Croissant French Toast Casserole with Berries and Cream is the stuff breakfast dreams are made of. Layers of buttery croissants are complimented by fresh fruit and sweetened cream. This is our favorite easy breakfast recipe! If you’re on the hunt for the ultimate brunch recipe sure to please, you’ve come to the right place. This Berries and Cream French Toast Bake is super simple, completely fool proof, and loved by anyone and everyone. 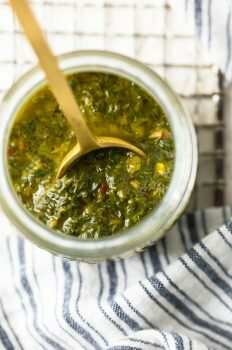 I simply cannot get enough of this make ahead brunch recipe that is perfect for a summer day, Easter Sunday Brunch, Mother’s Day breakfast in bed, or even Christmas morning for your most honored guests. We have tried a lot of simple breakfast casseroles around here, and this Croissant French Toast Casserole is hands down our favorite. So fresh and delicious! Cooking breakfast for your loved ones has never been easier than with this Berries and Cream French Toast Casserole. I’m not a morning person, unless someone is serving this recipe! 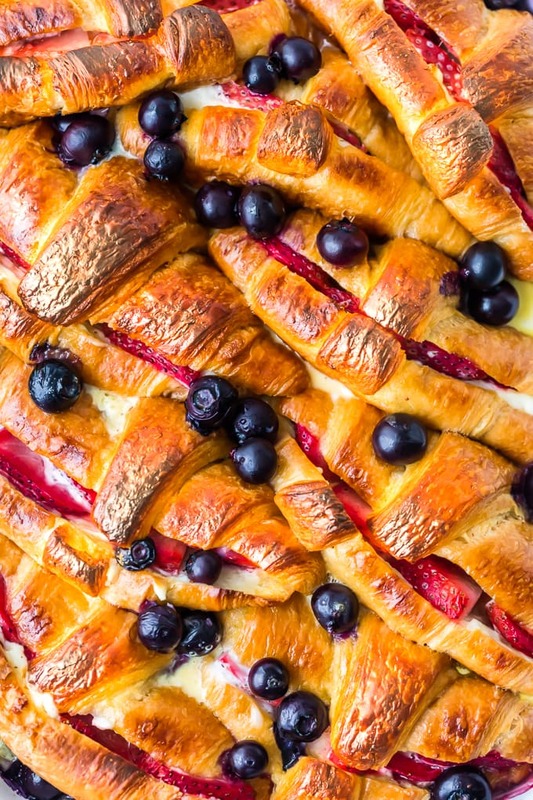 The key to an amazing Croissant French Toast Bake is…you guessed it…amazing croissants! I have recently fallen head over heels in LOVE with Marketside All Butter Croissants found at Walmart. I love that they’re inspired by French baking, set at an affordable price point, available all over the country, and made with all butter. 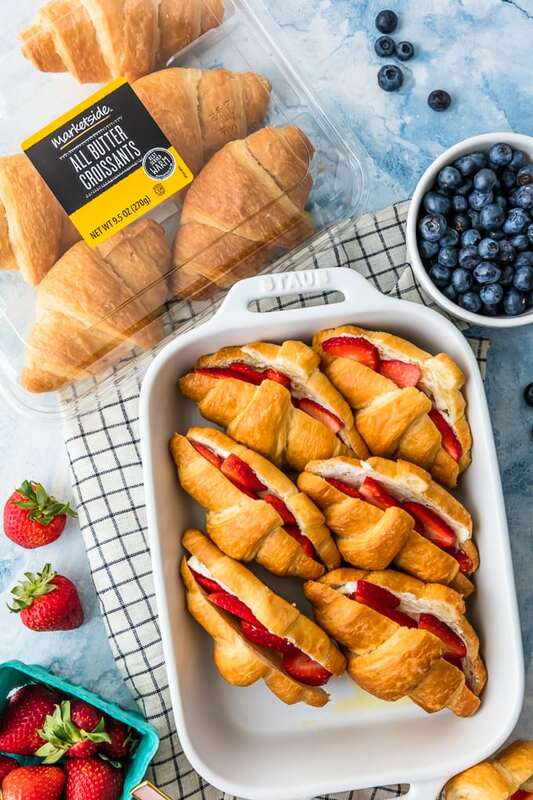 They’re great paired with any meal (I personally love croissants as our rolls at every holiday meal), but especially tasty at breakfast. Im willing to bet you have a lot of those ingredients in your fridge and pantry already. You’re so close to tasting the BEST breakfast recipe ever…can you taste it? Can this Croissant French Toast Casserole be made in advance? Yes! It can be prepared the night before and then baked in the morning. You can also make it right before baking if that’s easier for you. Letting it sit overnight will result in a softer texture once baked, but it’s all what you prefer. Totally up to you! Can French Toast Casserole be frozen? Once cooled, wrap fully (in dish) in two layers of plastic wrap and then one layer of foil. 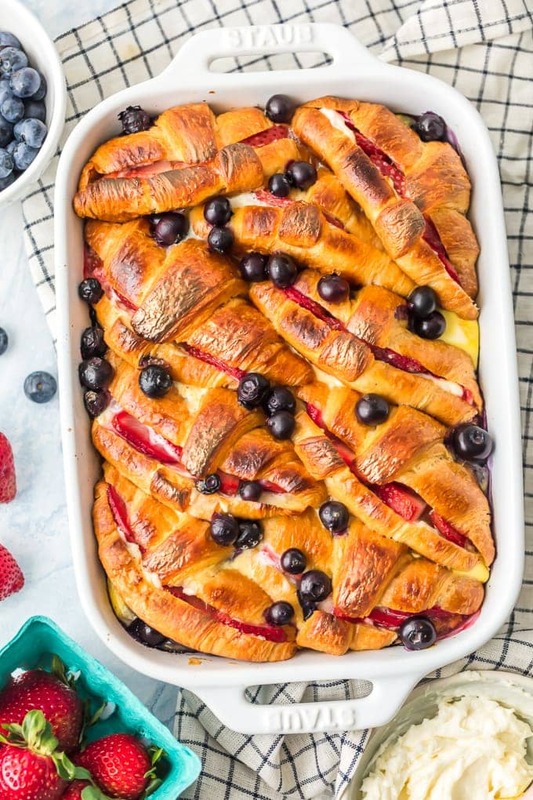 What are some good pairings for this Berry French Toast Bake? Can I make this Croissant French Toast Bake in other flavors? You can! You can make this Croissant French Toast with virtually any fruit you’d like! You really can’t go wrong by picking any fruit that is in season. We love it with raspberries, peaches, apples, and more! Get creative and let me know what you try. 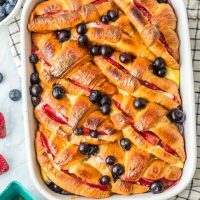 I hope this Berries and Cream Croissant French Toast Casserole brightens your morning and brings your family together around the table. It’s favorite of ours, even Henry’s! Be sure to let me know if you try it, and rate the recipe below in the recipe card. I’m so glad you stopped by. See the recipe card below for full details on how to make Croissant French Toast Casserole with Berries and Cream. 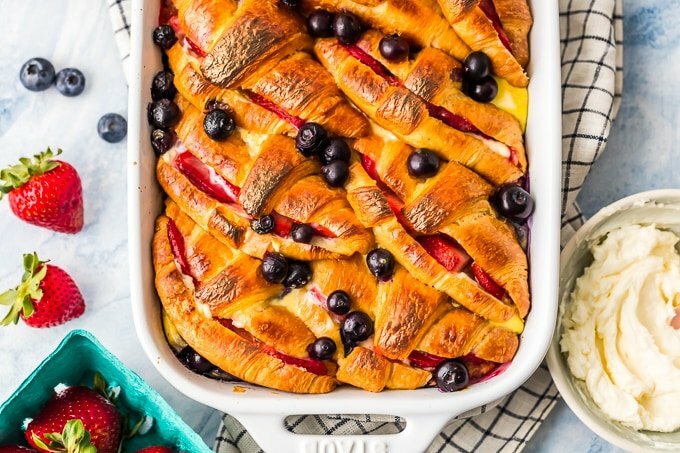 Want to pair this French Toast Bake with some fun brunch cocktails and mocktails? Here are a couple we recommend. Cheers! 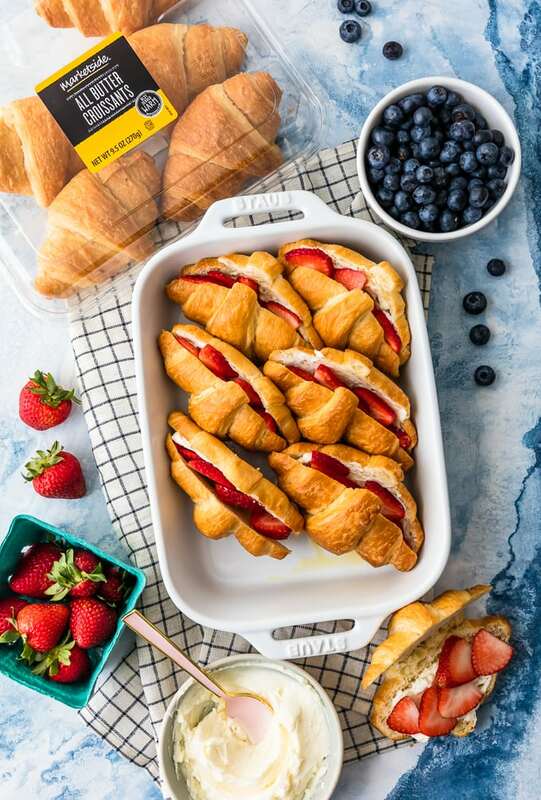 Croissant French Toast Casserole with Berries and Cream is our favorite easy brunch recipe fit for your closest friends and family. 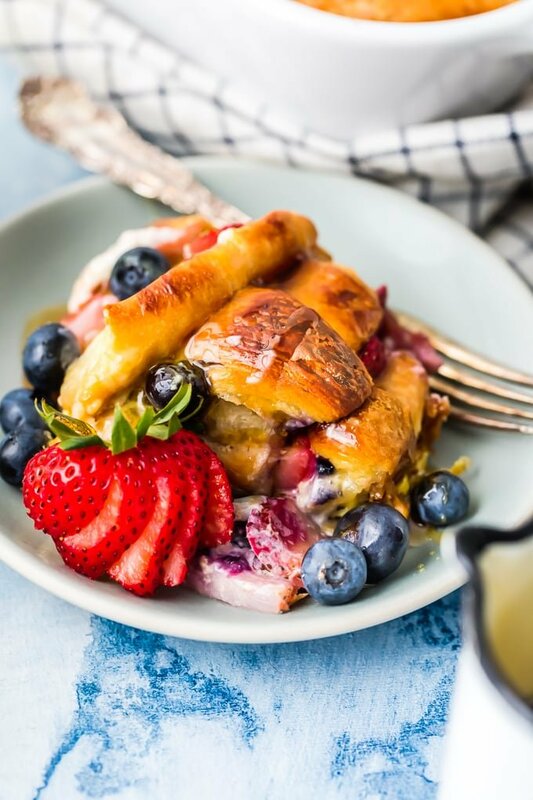 This indulgent breakfast French Toast Bake is made with layers of buttery croissants, sugary cream cheese, and fresh berries. You can make it ahead or right before you're ready to eat. Baked French Toast Casserole with Strawberries and Blueberries is the ultimate way to wake up! Spray a 9x13 baking dish with nonstick spray. Set aside. Slice each croissant length-wise, being careful not to cut all the way through. Take a spoon and spread approximately 1 tablespoon of the cream cheese mixture onto the inside of each croissant. Place strawberry slices (about 1 strawberry per croissant) onto the cream cheese and close the croissant. Repeat with all 10 croissants. Layer the croissants into the dish, packing them tightly. Sprinkle the blueberries throughout the dish. Pour egg mixture slowly over the croissants, making sure to get some in every nook and cranny. When ready to bake, cook COVERED for 25-35 minutes or until set. If you'd like your croissants to be extra toasty, you can broil slightly, but watch carefully so you don't burn the recipe. Serve with more maple syrup and fresh fruit. Simple and so into the season ! Thank you ! Hi, just want to confirm you only spread the cream cheese mixture on one side of the croissant, not both? Will it get too mushy if we do both sides? You can do it either way, but yes I did just one side. The entire thing gets a bit mushy since its a french toast bake. But I don’t like a TON of cream cheese in it. Hope you enjoy!